Can you confirm these amateur observations of Acontias meleagris? Types Syntypes: Lost. Described from a specimen in the Museum Adolphi Friderici (now in NRM), from Indiis (in error, the species is African), and reference to a specimen described by Seba. The NRM specimen is now lost (Andersson, 1899), and the specimen used by Seba has not been traced. Fitzsimons 1943: 244 said that the type is unlocated but suspected it in MNHN. Diagnosis Diagnosis (genus Acontias): Morphologically, members of the genus Acontias have SVLs that range from 225 mm to 490 mm, while the midbody scale rows range from 14 to 20 within this group (Broadley & Greer 1969). Biogeographically this group is distributed further along the west and south coasts of southern African eastwards into the interior of the subcontinent that includes Botswana, Namibia and Zimbabwe extending into south-eastern Kenya. Within this group, systematic affinities, particularly in the highly polymorphic Acontias meleagris complex (comprising A. m. meleagris, A. m. orientalis, the morph lineacauda and A. p. tasmani), warrant additional study (Daniels et al. 2005). A study in currently in progress that will attempt to delineate species boundaries within this complex. Convergence in apparent diagnostic features appears widespread among fossorial taxa. For example, two independent studies performed by Whiting et al. (2004) and Schmitz et al. 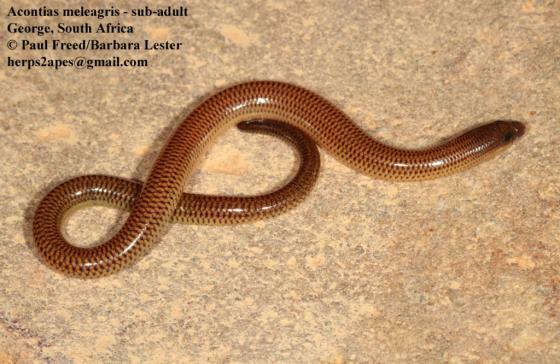 (2005) suggest that the Malagasy fossorial skink genus Amphiglossus as currently defined is not monophyletic and is comprised of two genetically highly distinct groups. These results suggest that morphological characters currently used in the taxonomy of fossorial skinks are homoplastic and warrant closer scrutiny. The apparent lack of well-defined synapomorphies at least for some genera is clearly an obstacle in determining the diversity of fossorial groups. 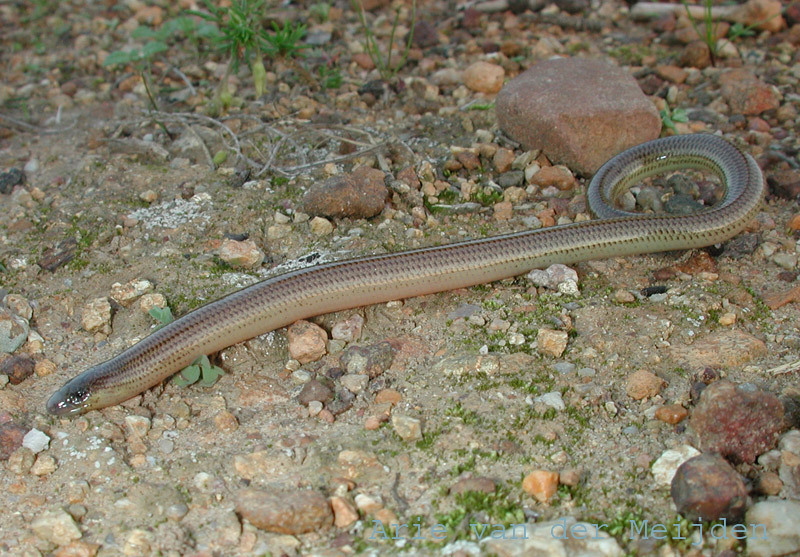 The description of this new genus within Acontias suggests that a number of previously defined generic groupings in other skinks may indeed be artificial units, and that a number of the southern African skink genera may contain considerable taxonomic diversity obscured by symplesiomorphic morphological features. From an evolutionary perspective, the morphological differences between Acontias and Microacontias gen. nov. pose some interesting questions. We hypothesize that it is likely that the differences in body size have led to the development of reproductive differences between these two ecomorphological groups that are likelyenforced by resource partitioning among sympatric taxa. We recommend that where taxonomically ill-defined paraphyletic groups have been recorded with mtDNA sequences, they should be confirmed with the use of nDNA sequences; and where congruent, the appropriate taxonomic changes made to relect current trends in phylogenetic hypotheses. Such studies are likely to uncover a wealth of new genera and taxa that have previously been obscured by convergent characters, particularly among fossorial groups. Considering that most fossorial taxa have limited vagility, and a large number are point endemics, the effective conservation of this faunal group and their vulnerability to extinction underscore the need for a sound taxonomy that accurately reflects diversity and evolutionary history [from DANIELS et al. 2006]. Diagnosis (genus): Body moderately attenuate (SVL 20–33 times body diameter), midbody scale rows 12– 20,145–195 ventral scale rows, subcaudals 22–46, dorsal head shields 29–50, 3–5 chin shields bordering mental, snout not strongly acutely angled, movable eyelids present, lower eyelid immovable, or eyes covered by head shields, dorsal coloration variable, dorsum solid or striped, but never pigmentless. Jugal present or absent, pectoral girdle rod-shaped or nodular, typically 21–29 (or more) caudal vertebrae. A. m. orientalis possesses a distinct morph called “lineicauda,” of uncertain taxonomic status. A. m. meleagris and A. m. orientalis can be easily distinguished based on the presence or absence of six well-defined stripes on the dorsal surface. Generally, in A. m. meleagris stripes are absent, and the tail is non-tapered, while in both A. m. orientalis and the “lineicauda” morph six stripes are present on the dorsal surface, with the “lineicauda” morph being smaller bodied and slender compared to A. m. orientalis (Branch, 1998). A. m. orientalis is closely related to A. percivali tasmani (based on DNA sequence analysis) but A. m. orientalis can be distinguished from A. p. tasmani in possessing six distinct dorsal stripes, but the taxon, A. m. meleagris also possesses distinctly striped forms at Paarl, Hermanus, and Devils Peak (Fitzsimons, 1943; Hewitt, 1938; Daniels et al. 2005). Conversely, Broadley and Greer (1969) reported that certain populations of A. m. orientalis occasionally contain uniform, unstriped specimens that are indistinguishable from A. m. meleagris. Broadley and Greer (1969) further observed that variation in A. meleagris is mosaic and not clinal. Coastal populations of A. m. meleagris (such as Robben Island, Velddrif, and Mossel Bay), for example, are characterized by melanistic individuals in which the dorsal surface may be uniformly dark. Type species: A. meleagris is the type species of the genus Acontias CUVIER 1817 (DANIELS et al. 2006, LAMB et al. 2010). Synonymy: based on DNA sequence data, DANIELS et al. (2005) suggest that both A. m. orientalis and A. p. tasmani are invalid taxonomic designations, and should be regarded as junior synonyms of A. m. meleagris. Broadley, D. G. and Greer, A. E. 1969. A revision of the genus Acontias Cuvier (Sauria: Scincidae). Arnoldia Rhodesia 4 (26): 1-29.